Halloween is over all ready. November 1 starts my unofficial boycott of Christmas. Not that I have anything against Christmas. I love it! But I’m sure like many others, I like to enjoy the fall and Thanksgiving, rather than rush into the holiday. It gets old by the time December 25th comes around. So my boycott begins by again dwelling on Halloween. This year we were “At the Movie Theater Concession Stand.” The weather was beautiful this year. Jack joined in with Trick-or-Treating with his older cousins. I think he enjoyed the walking better than the candy, although he did dip into his bucket a few times during the walk. I took Daisy along too. Her costume was so good, most people didn’t even know she was there! 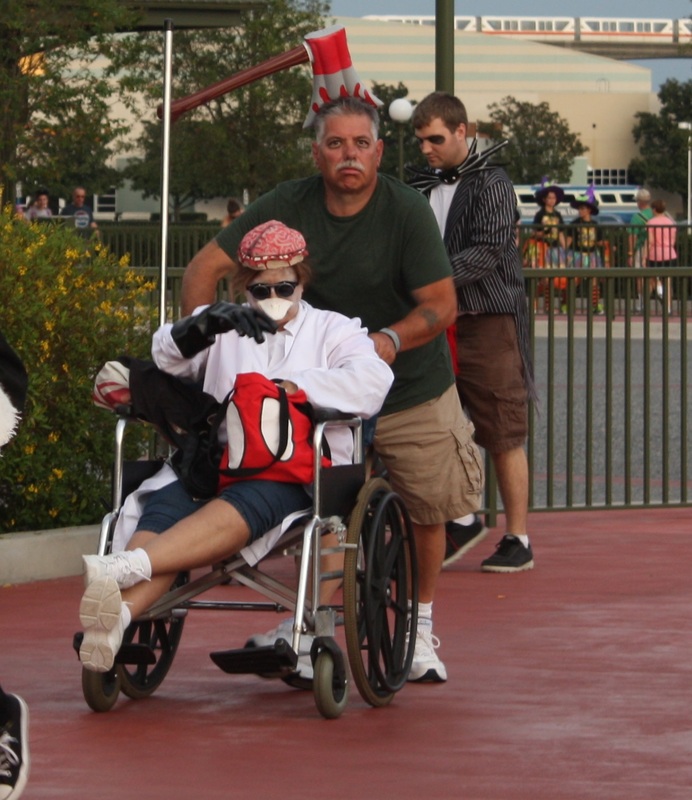 Like last year, I made costumes for almost everyone so we could walk as a theme. I based the theme off Daisy’s costume: the popcorn bucket. I saw a version of it on Pinterest and knew I wanted to do it months ago, but my version was a bit more extreme. My version was made with a felt blanket I painted as a popcorn bucket using stencils I made from my Cricut. I used tissue paper as the popcorn and glued it to the blanket and to a baby hat for daisy. I just wrapped the blanket around Daisy’s carrier and tucked it in the sides. Her little head stuck out but was covered with the popcorn hat. I put on some 3D glasses and it looked like I was just walking around with a giant tub of popcorn at the movies. Jack went as a movie ticket and Matt was the Box Office Ticket collector, both costumes made with cardboard, Cricut cut vinyl, paint, and ribbon. 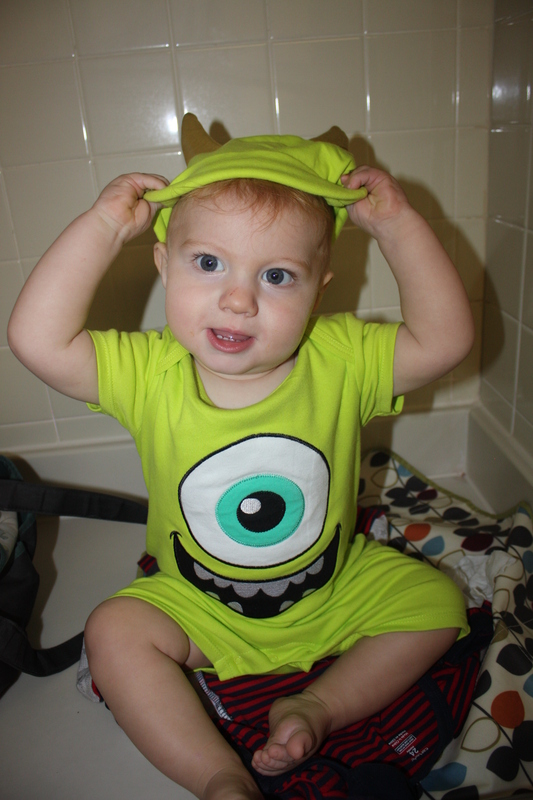 The “over the shoulder” type costume was good for Jack because it was easy to put on and take off when he was fussy. The rest of my nieces and nephew also joined the theme. I made 3 of their 6 costumes. I made Laila a cardboard Kit-Kat bar costume (I have a lot of cardboard on hand between boxes of diapers and wipes.) Olivia was Button candy, made with an old dress and painted Styrofoam balls. Myla was our cup of Coca-Cola, made from a small hamper, craft paper, paint, and vinyl. I especially liked her straw hat (complete with “Diet,” “Regular,” and “Other” buttons). The store bought costumes were cute too – Craig was also popcorn, Angelina was an M&M, and Jenna was Nerds. I think we made a really cute concession stand! Monsters Inc for Halloween on the road. 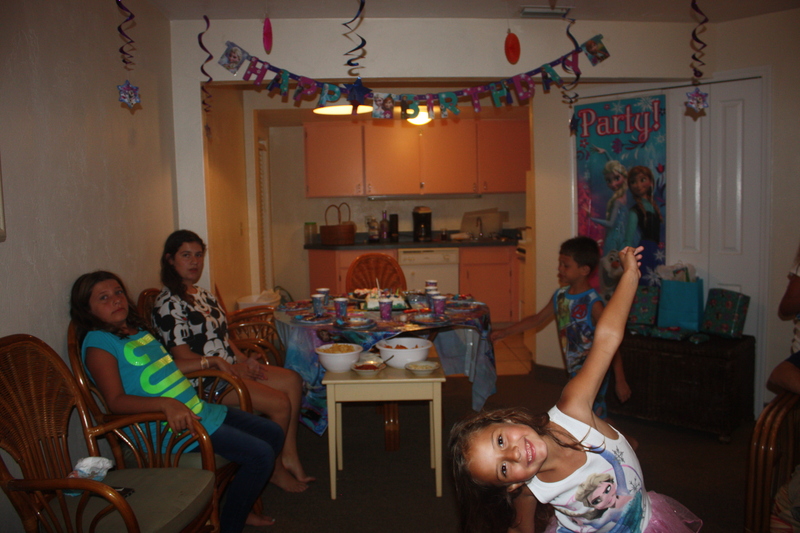 We gave Myla a surprise party, and oh she was so cute! She really was surprised. It’s just 2 weeks after Halloween, but if you walk into any store you’d think Christmas is next week. I even got sucked in buying a Christmas book for Jack and catching myself planning Christmas decorations. So, I’d like to regress and talk about Halloween, my vacation, and how Christmas can wait so it doesn’t get stale by December 25! After driving down to Florida (about 18 hours), we started the vacation by going to the Magic Kingdom for Mickey’s Not So Scary Halloween Party. It was a blast. Adults are allowed to dress up and the park is open until midnight. Since most people crash around 10, the park became pretty empty for the last 2 hours. We even met the Seven Dwarfs, a very rare occasion that only happens on Halloween and Christmas. We all dressed up as characters from The Nightmare Before Christmas. For the most part, I made the costumes. 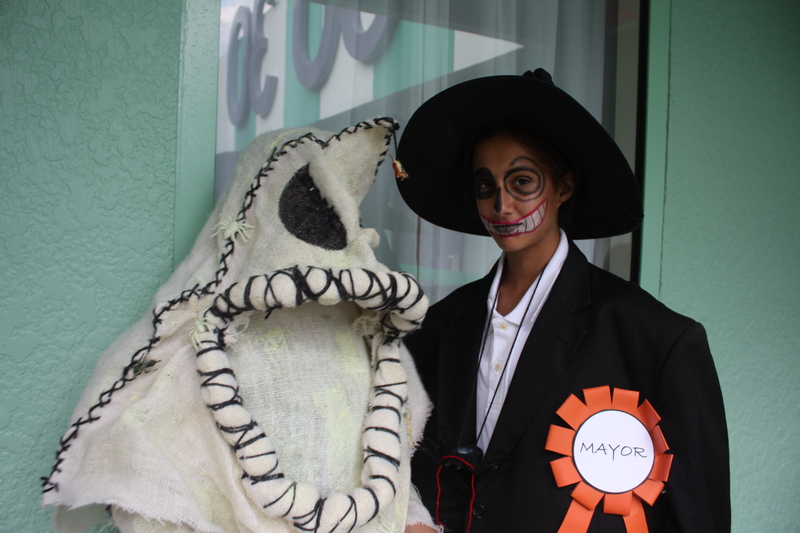 My favorites were The Mayor (Jenna), The Boogieman (Olivia), and Dr. Finkelstein (my mom, though she didn’t take many pictures in the wheelchair). The three little ones were Lock, Shock, and Barrel, my dad was the character with the ax in his head (We gave him the most minimal costume), and Angelina was the demented vampire toy. Jack was Zero, but it was so hot he could only wear his hat in the park. When I post how-tos, I’ll post the whole of all the costumes. Matt was Jack Skellington and I was Sally, and they were the only costumes I didn’t make. I bought my dress at Hot Topic rather than a costume store. It was the same price, much more comfortable, and the pattern went around the whole dress, not just the front like the costumes. The most home made thing I did for my costume was my makeup and nails. We went to all the other Disney parks and Universal Islands of Adventure, and met some celebrities. Did you know Mickey Mouse TALKS when you meet him in Magic Kingdom!? I was starstruck! Then we finally crashed at the beach in Daytona for a few days. There was a heat wave our whole vacation, so it was about 100 degrees, but by the beach, the breeze felt awesome. Now that I’m home, I am in full end-of-year mode. I’m playing around with some recipes for Thanksgiving, and I’m starting to get ready for Giacomo’s first birthday! I can’t believe a year is almost here! I’m so excited to give him a fun birthday, even if he won’t remember it.